I plan my meals way, way too far in advance. My only consolation is that every once in awhile, too much thinking about food pays off. In this case, two plans collided to create an interesting new variation. On the one hand, I decided to make chicken pot pie on Friday. That meant picking up some chicken. On the other hand, I visited an Indian restaurant and left with some leftover chicken tikka. Eventually, these two ideas combined: I didn't have to buy more chicken, nor did I have to freeze the chicken tikka for some unspecified future meal. I could put the two together. 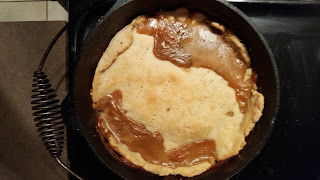 Here is the filling just before I topped it with the crust. 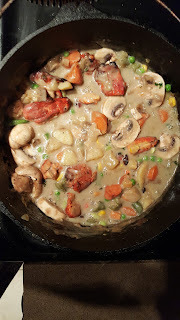 I made a roux using some chicken broth I had canned a few months ago along with some cream and milk. 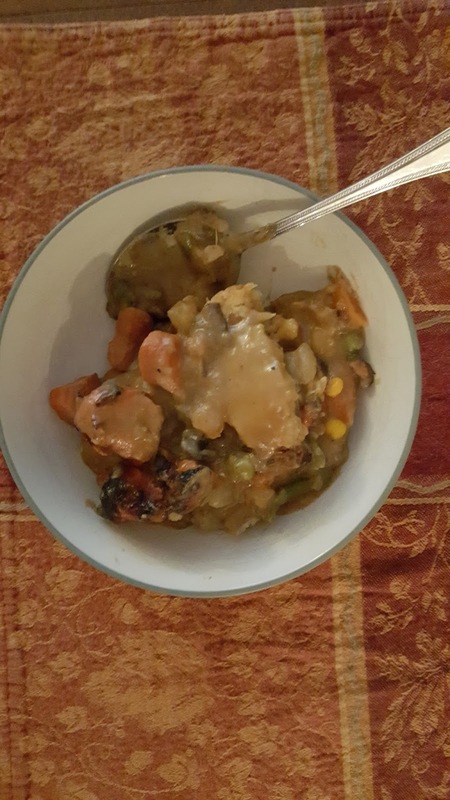 I added as vegetables onion, a diced potato, some diamond-cut carrots, mushrooms, and some frozen mixed vegetables. At the last minute I added the chicken tikka. I added the usual chicken herbs. Here it is just out of the oven. And here is my portion ready to eat. I wasn't sure if the tikka flavor would come through but it certainly did. I am very happy with the cross-cultural combination. One could clearly make an Indian chicken pot pie with all sorts of interesting spices; I might just do that soon. But the tikka also enriches a traditional American hearty meal, too.